Before I fish a stretch of water, I analyze it and develop a game plan for how to fish it. Before the big game, the coach always gives a pep talk to the team. It’s not only to motivate the players, but also a last minute chance to cover important assignments and details. My “on-the-water analysis” is equivalent to pregame preparation— it’s a moment of study and consideration, and time to get in the zone mentally. The first consideration is water dynamics: the current speed and depth. More than anything else, these two factors determine which nymph-fishing method I’ll use to present the flies to the trout and meet the two goals of contact— contact with the strike zone and contact with the flies. Once I’ve chosen the best method, I then take a moment to identify feeding lanes and specific feeding lies. I want to pick out the high-confidence lies and the prime lie. High-confidence lies mean short-range nymphing methods whereas low-confidence lies mean I’ll have to fish from afar and take more care in the approach. I want to fish the prime lies first, if possible. Or at least devise a plan of attack that avoids disrupting the fish feeding on those stations. Then approach angles and reach come into play: Once I Identify where I want to fish, I need to choose the best place to fish from. Then two questions need answers. First, can I get there safely? I’m not a strong wader who likes to wade in fast, deep water, so my first concern is safety. Joe wet his cress bug fly and then held it to the natural insect found on the underside of a rock to match size, shape, and color. Second, can I reach the fish from the location I’ve chosen with the nymph fishing method I’ve selected? For instance, if I can’t get close to the best run, I won’t be able to use a short line technique. This happened to me below Rim Shoals on Arkansas’s White River one spring when high water flows prevented me from wading close enough to reach the best run with a short-line technique. I had to abandon my preferred technique and come up with an alternative, which in that case involved floating indicators. Then I identify other challenges or tricky spots that might be involved. Fishing the Gallatin River with Evan one year where a riffle tailed into a deep pool, the best place to fish the head of the pool was from a rock rising several feet above the water’s surface. Not only was this the best place to fish from, it was pretty much the only place. Most of the rest of the shore was unapproachable. The rock was surrounded by deep water, with the exception of a small spot just behind it where it was shallow enough to stand. But you had to stand on the rock to reach the run, holding the rod at arm’s length over the run. We hooked several nice fish, but landing them was a challenge; it required leading them to the soft water behind the boulder and sliding down the rock on our backsides to the small spot between the rock and the shore—all the while keeping the rod bent to the fish. Then we had to scale back up the rock to start over. I should have gotten my merit badge in mountaineering that day. My last consideration is fly choice. Knowing the food that’s available to trout in the river you’re fishing can’t be overemphasized. Fishing with Ed Jaworowski and Tom Baltz on the Yellow Breeches, we shook streamside bushes and plucked rocks from the streambed to look for bugs— you need to look at the menu before you order. It’s a habit Joe Humphreys also has. When we arrived at Spring Creek last year, we picked up streambed rocks to examine the local fauna—the food available to trout. He identified cress bugs and Sulphur nymphs and then opened his multipaneled fly box and plucked out his favorite cress bug fly and a small Pheasant Tail Nymph to use as a dropper. He compared each fly next to the natural to match the size and then dipped the flies into the water to match the color of the wet fly to the bugs. Our fly needs to match the natural in the water, so wet the fly; the color often darkens after the fly gets wet. For instance, it doesn’t pay to tie on a scud fly if few natural scuds populate the river—and not all rivers have high scud populations. 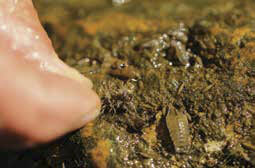 Scuds favor alkaline waters— sow bugs, too. Most limestone streams have them, as do most tailwaters, but rivers with high tannins or flowing over granite substrate have fewer because of the water’s acidity. So it pays to know your river. Or at least to check under a few rocks. Lastly, I envision the act of fishing: the cast, the drift, the hook set, and fighting the fish—a trick I learned from Tom Baltz. I envision the hook set so that I’ll react appropriately when the time comes. I’ll know which direction to pull the rod during the hook set so I have the best chance of setting into the fish, not away from it. I try to set the hook to the side or in a downstream direction when the fish is upstream of my position. The last choice of hook sets is pulling the rod upstream when the fish is downstream of the angler’s position. This leads to the most missed fish, since it tends to pull the fly from the trout’s mouth. I also envision the fight, asking myself the following question: Where should the fish be played to have the best chance of landing it? If I’m fishing in an upstream manner, I’d like to swing the fish downstream during the fight to avoid disturbing other fish. I prefer to lead them out of fast water and into a quiet pocket. I also try to keep them from logjams, rock piles, and other places where it’s easy to lose fish. It pays to plan ahead; envision the hook set and playing the trout so when it occurs, it’ll seem like you’ve already practiced it before. Tom Baltz is always aware of the playing field—he identifies the problem spots and locates the best place to play and land a fish before he makes the first cast. For instance, if a logjam flanks a nice run, any self-respecting trout would likely bolt for it once hooked. Knowing that fact ahead of time helps prepare you to steer him away from it. 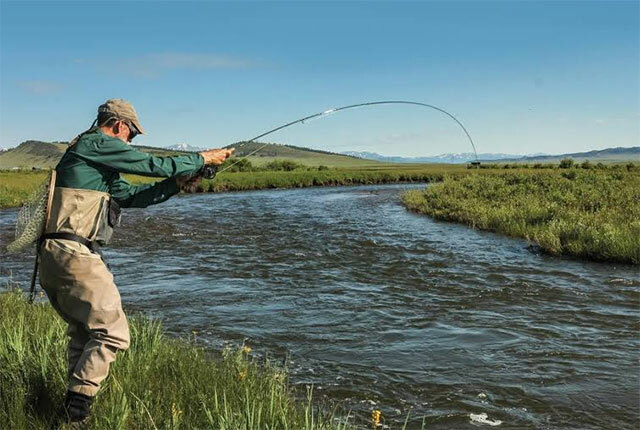 As the trout dives for cover, rather than holding the rod straight up, lay the rod over horizontally to pull him away and lead him downstream. Don’t be afraid to put the rod tip and upper rod section into the water. Lead him into slower water next to or below the run to land him. In other words, play the fish; don’t let him play you. Choose your battlegrounds. Fight the fish where you have the advantages; it’s much easier to fight and land a fish in a quiet bit of water than a swift-flowing run. 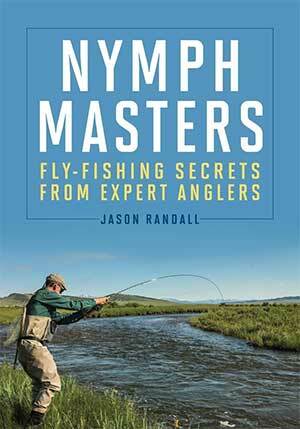 Excerpted with permission from Nymph Masters: Fly-Fishing Secrets from Experienced Anglers (Stackpole Books, April 2017), all rights reserved.